Back at the beginning of the year, Patriot were kind enough to send us one of their Extreme Performance PC2-8500 kits for review. Managing an extremely respectable overclock and decent overall performance, the kit left with out Editors Choice award and an impressive 92% final score. With their headquarters based in sunny California, Patriot has been producing high performance memory modules under their parent company PDP Systems for over 20 years. Sale of their modules is on a global scale with distributors throughout North America, Europe, Asia Pacific, Middle East, Africa, and Latin America. It would be fair to say that Patriot is better known by our overclocking buddies over in the USA, but with their reputation for performance building with every new product released, they are certainly making serious headway in the UK. Founded in 1985, a member of JEDEC, PDP Systems has been a value-added global technology solutions provider. PDP manufacturers and distributes DDR2, DDR, SDRAM and Flash memories. PDP's services include worldwide OEM contract manufacturing and private label. PDP's state-of-the-art Fremont, California, facility is composed of multiple production lines, and a highly skilled production staff. This gives PDP the ability and resources necessary to provide a full line of memory module solutions. Considered by many as one of the top memory manufacturers in the market, Patriot certainly have a lot of fierce competition on their hands. By taking a quick browse of the specifications available on their website, we should be able to find out what attributes (if any) separate Patriot from the rest of the crowd. Patriot Extreme Performance (EP) Low Latency line is engineered to expand your gaming options. These modules are designed to operate at 1866MHz at 8-8-8-24 timings and are available in 2GB kit capacities. They are equipped with Patriot Aluminum Bladed Heat Shield Technology?to improve module stability and performance while operating under extreme overclocking conditions. Engineered with quality and Performance in mind, Patriot Extreme Performance line is the ultimate solution for extreme overclockers, gamers, and PC enthusiasts. 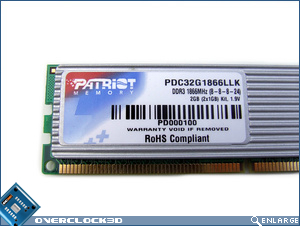 As you'd expect from a top memory manufacturer, Patriot have furnished the PDC32G1866LLK kit with a lifetime warranty. Unfortunately Patriot have not specified if this warranty covers the modules past their stock voltage of 1.9v, and as a result this may deter overclockers who want to put extra voltage through the modules to achieve a higher overclock. 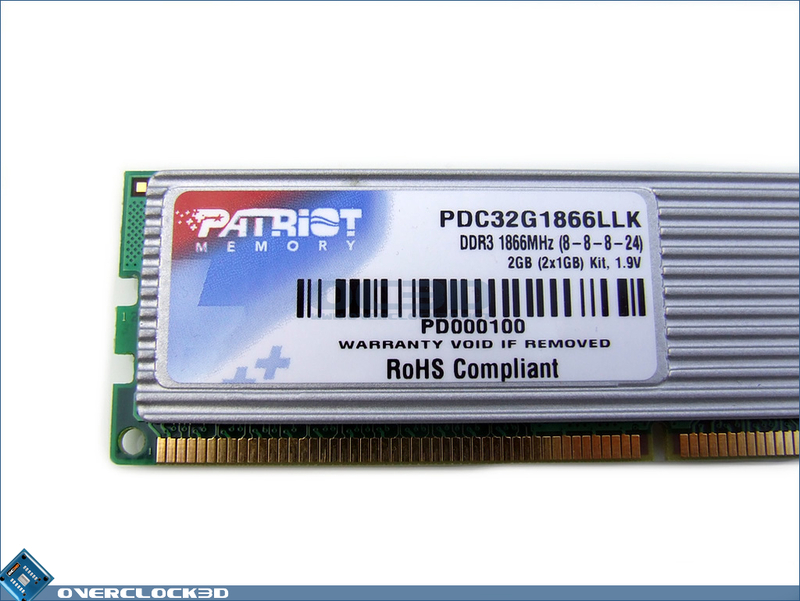 Patriot also state that they have tested the modules on both Intel P35 and X38 chipsets, which is certainly good news considering these are the two main DDR3 chipsets available on the market at the moment. Normally at this point I'd pop off the heatspreaders and take some snaps of the IC's used on the modules. However, the heatspreaders appeared to be fixed to the modules with a strong adhesive that totally flawed my attempts to prize the modules apart. Based on Patriot's previous preference for Micron IC's I'd hazard a guess and say that this kit is based on D9GTR - but don't quote me on that.